Ghost Pirates is a slot game from NetEnt, so we at Boku Slots immediately knew to expect something good. After playing for a while we certainly weren’t disappointed because this game combines a spooky pirate theme very reminiscent of the movie franchise Pirates of the Caribbean, with the high quality gaming you normally get from NetEnt. So let’s tell you swash buckling gamers what you can expect from this mysterious game. 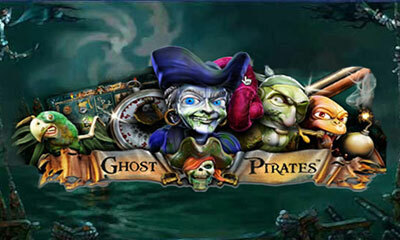 Ghost Pirates is a 5-reel and 243 pay line slot that has an impressive RTP of 98.49%! Yes you read that right. But it’s not just the pay-out percentage which will get you excited, because there are some amazing features available too. 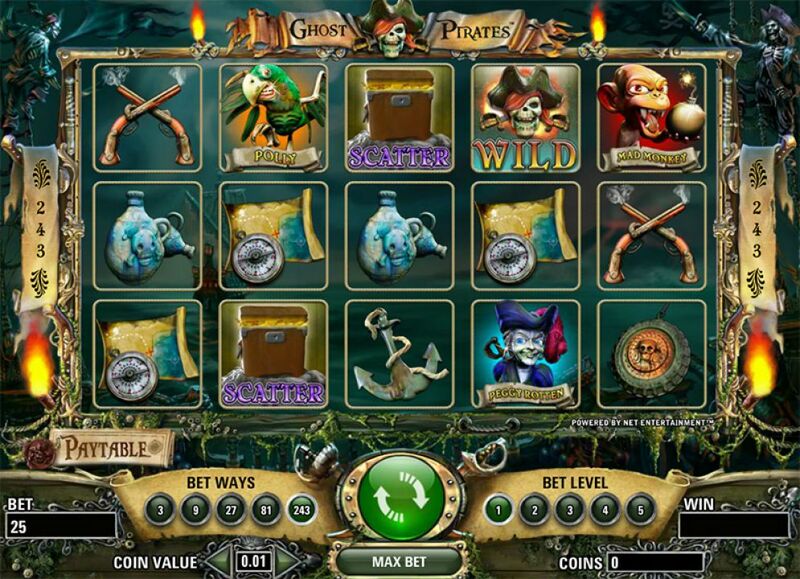 Bet Amounts – Betting on Ghost Pirates begins at 1p on bet level 1, meaning spins can cost just 25p for 243 pay lines to be in play. Now for us that is simply fantastic, however to add to this you can decrease your pay lines if you wish to 3, 9, 27, 81 or back to 243 lines in play. This will alter the minimum bet from lower to higher whenever you amend the pay lines. The maximum bet is 50p coin amount at coin level 10 making your total per spin just £2.50. But again by decreasing the lines in play, the coin amount and the coin level you can tailor your bet to your own pocket. Wild Symbol – The wild symbol on Ghost Pirates is depicted by the well-known logo of the skull and crossbones, hovering over the word wild. The wild substitutes for all symbols except the scatter. Scatter Symbols – Your scatter symbol is none other than the pirates treasure chest. By landing 3 or more of these on a winning pay line, you will be awarded the bonus spins feature. Other Symbols – We love how all the symbols within the game are pirate themed and even have names too. On the highest symbol we have Peggy Rotten paying the maximum of 1,500 coins for 5 on a winning line, to One Eyed Ed, Mad Monkey and Polly. Then we have your lower paying symbols starting with a set of pistols paying 200 coins, leading down to a medallion, compass and map, urn, cannon and anchor. Be sure to check the pay tables, as the pay-out does vary when playing with 3, 9, 27, 81 or 243 lines. 5 scatters award 20 spins. 5 scatters award 25 spins. NetEnt have done it again, with a truly immersive slot which offers amazing features and affordability. All of the graphics are brilliantly drawn and not too over the top, which we find can be distracting in other slot games. The soundtrack is great as well and doesn’t make us reach for the silent button, which is always a bonus. Overall we enjoyed Ghost Pirates and with its amazing RTP of 98.49% we are sure you will too.